Normal cooking often leaves a greasy film or burned spots on your stove. 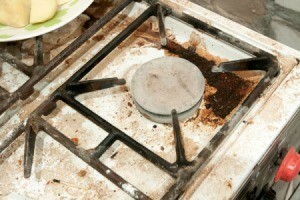 This is a guide about cleaning grease buildup on a gas stove. How do I clean baked grease on the back of a gas stove? I learned this from my aunt. She uses oven cleaner for cleaning the top of her gas stove and it looks brand new. I have an old O'Keefe and Merritt Gas Stove. It has a grill and boiler, I need to clean under the grill. How do I get rid of the old food build up? I also have the water heater next to the stove and it has built up grease, how do I get rid of that as well? Thank you in advance for your help. 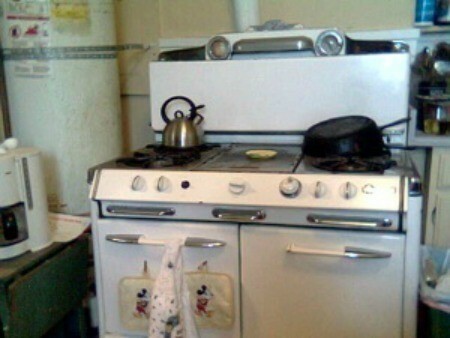 I just recently got a new Thermador stainless steel gas stove top with 6 burners. The burners are already stained from grease buildup. I tried Easy Bam and 409, nothing is helping these old stains. Any suggestions? I use Dawn dish liquid. I put a little on a wet cloth and get the stove soapy and then wring out the cloth and wipe off the soap. May have to wring out a couple times. Regardless, remember to cover the holes of your gas elements WELL or risk clogging/ruining them.